Skip the airport transfer bus by adding some VIP luxury to your trip with Heathrow MBW Meet & Greet. 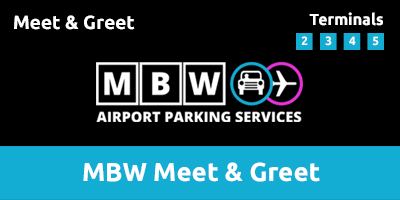 This drive-up and drop-off service is perfect for those travelling with children, weighed down by baggage or who just want to make a quick getaway; parking with MBW Meet & Greet is a breeze. No transfer is required with this meet and greet service. Your car will be parked in a Park Mark Safer Parking Awarded compound protected by 24/7 security, CCTV and perimeter fencing. Meet and greet is ideal for passengers who require any extra assistance. 04:00-23:59, 365 days a year. Operates from 04:00 to midnight. A charge of £25.00 applies between midnight and 4am for arrivals and returns. A charge of £25.00 applies for long wheel base vehicles. Follow road round to Terminal 5 Roundabout. Follow road round and staying right head up the ramp to the Short Stay Car Park. Go staright over the next 2 roundabouts ending up on Southern Perimeter Road. Stay left and take the slip road up to the T4 Roundabout. Follow the road round to the Short Stay Car Park. Follow the road round and join the M4. At the "Welcome to Heathrow" long roundabout stay in the right hand lanes and head straight over. Exit the tunnel and follow signs for your terminals Short Stay Car Park. Please call MBW approximately 30 minutes prior to reaching Heathrow. You must keep us informed if you are likely to be early or late with as much notice as possible. You must photograph your own vehicle at Drop-Off. Follow signs to the ‘Short Stay Car Park 2’ (look for Off-Airport signs). As you leave the tunnel you will need to be in the right hand lane. Drive up the ramp and follow the road to the right, head under the height restriction arm. Keep in the FAR right hand lane and approach the barrier (Level 4). At the barrier, take a ticket (you need to give this ticket to the driver). Follow the ‘Off-Airport’ parking signs until you reach Rows A & B at the far end. Park in Row A or B and a MBW chauffeur will be waiting near the ticket machine. Larger vehicles to head to over height parking – additional charges will apply. Please take photos of your vehicle from all angles clearly showing the vehicle in the short stay car park. As you leave the tunnel follow signs toward Terminal 3, Short Stay Car Park 3. Please take a ticket and enter the Short Stay Car Park and drive up to Level 4. Follow signs for Off-Airport Parking and make your way to rows A and B where a uniformed MBW driver will meet you. Please take photos of all angles of your car as well as clearly showing it is parked in the short stay car park. As you leave the Terminal 4 roundabout, follow signs for Short Stay Parking. Drive up the ramp and stay towards the right. Taking a ticket enter the Short Stay Car Park, stay on the right and go to level 2. Follow signs for Off-Airport Parking, Rows E and Fand park in a bay where your uniformed driver will meet you. Please take photos of all angles of your car as well as clearly showing it is parked in the short stay car park. Follow signs for ‘Terminal 5 Departures’. Keep in the right lane & head up departure ramp (Passenger pick up Short Stay signs). Follow signs to ‘Short Stay Car Park’ (look for Off-Airport signage). Keep left and head towards the last set of barriers. Please take a ticket and enter the car park on level 4 (Hand ticket to MBW Captain). Follow signs to Off-Airport, rows R and S where your MBW driver will meet you. Larger vehicles to head to Over height Parking – additional charges will apply. Please take photos of all angles of your car as well as clearly showing it is parked in the short stay car park. Park your car in the indicated bays and photograph your vehicle (damage claims not accepted without photographs from drop-off point). Give your keys to the chauffeur (Car key/ alarm key only. Remove all other keys). Make the short stroll to the check-in desks. Give MBW a call once you’ve collected your luggage and cleared customs on 020 8759 5252. The chauffeur will meet you with your vehicle, validate your parking ticket and you will be free to set upon your journey home.